"A good song reminds us what we’re fighting for." The great Pete Seeger has passed away at the age of 94. Obituaries recounting his activism and folk singing, his moral strength and indelible contributions to not only American folk music, but the struggles for civil rights, equality and peace, are now everywhere. He sang for liberty; he sang for labor; he sang for the oppressed, he sang for the land and the air and water; he sang for the tired and poor. He sang about dangers and he sang out warnings. He sang out love. He sang for you and me. Reflecting on his life and career during an interview in 2010, Seeger said, "The most important thing is that I did not want to become rich, not become a part of the establishment." I share a hometown with Seeger; we were born and raised on the banks of the same river. I've had the privilege of wading waist-deep in the mud and pulling weeds alongside him in the shallows of the Hudson. I have sailed on the sloop Clearwater and have sung with him around a campfire. For this, I consider myself lucky. And today I am sad. 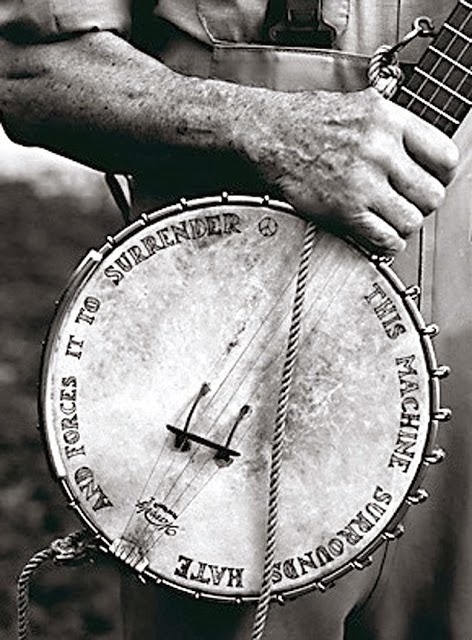 The twang of Pete Seeger's five-string banjo and the tremble in his unmistakable voice - the People's voice - taught me not to study war and told me we were not alone and not afraid. While his hands hammered out justice, his words rang out freedom. He told me to take it easy, but take it. And I learned from Pete that we shall overcome. Someday. I can think of no better tribute to him - consistent champion of the ninety-nine percent, a true American hero walking that freedom highway - than to let his own words speak for themselves, words not found in his music, but rather on the floor of the United States government's House Un-American Activities Committee on August 18, 1955. The text is below. Subpoenaed to testify during the dark days of McCarthy's anti-Communist witch hunts, he refused to invoke the Fifth Amendment, instead chastising Fascistic Congressmen for their loathsome line of questioning. He never named names. He was blacklisted, found in contempt and held his head high. His testimony is a damning indictment of power and fear and an inspiration to those who refuse to remain silent in the face of injustice, of greed, of hatred, and of violence. "I have sung for Americans of every political persuasion, and I am proud that I never refuse to sing to an audience, no matter what religion or color of their skin, or situation in life. I have sung in hobo jungles, and I have sung for the Rockefellers, and I am proud that I have never refused to sing for anybody," he told the committee. "Singing is my business," he said. 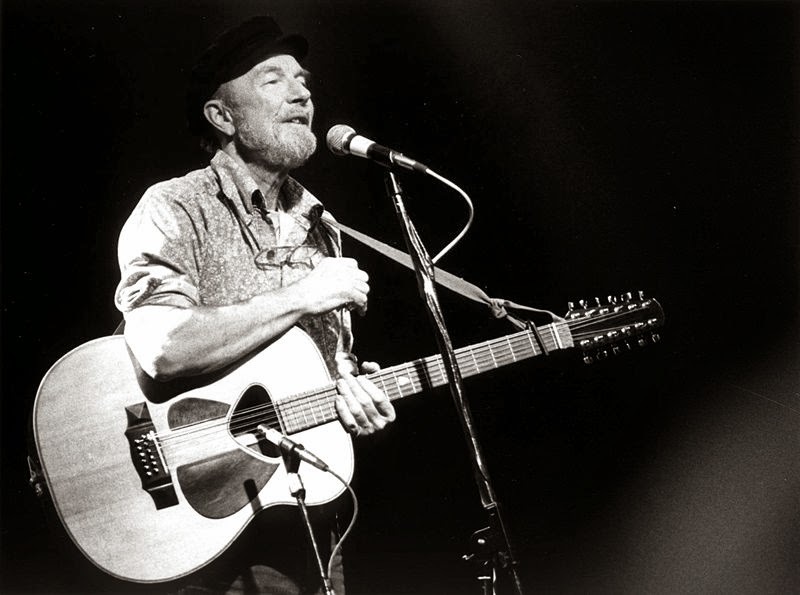 Without Pete Seeger, the state of our union is far worse today than it was yesterday. Take it easy, Pete, we'll take it from here.
. . . Mr. TAVENNER: The Committee has information obtained in part from the Daily Worker indicating that, over a period of time, especially since December of 1945, you took part in numerous entertainment features. I have before me a photostatic copy of the June 20, 1947, issue of the Daily Worker. In a column entitled “What’s On” appears this advertisement: “Tonight—Bronx, hear Peter Seeger and his guitar, at Allerton Section housewarming.” May I ask you whether or not the Allerton Section was a section of the Communist Party? Mr. TAVENNER: Has the witness declined to answer this specific question? Chairman WALTER: He said that he is not going to answer any questions, any names or things. Mr. SCHERER: He was directed to answer the question. Mr. TAVENNER: I have before me a photostatic copy of the April 30, 1948, issue of the Daily Worker which carries under the same title of “What’s On,” an advertisement of a “May Day Rally: For Peace, Security and Democracy.” The advertisement states: “Are you in a fighting mood? Then attend the May Day rally.” Expert speakers are stated to be slated for the program, and then follows a statement, “Entertainment by Pete Seeger.” At the bottom appears this: “Auspices Essex County Communist Party,” and at the top, “Tonight, Newark, N.J.” Did you lend your talent to the Essex County Communist Party on the occasion indicated by this article from the Daily Worker? Mr. SEEGER: Mr. Walter, I believe I have already answered this question, and the same answer. Chairman WALTER: The same answer. In other words, you mean that you decline to answer because of the reasons stated before? Mr. SEEGER: I gave my answer, sir. Chairman WALTER: What is your answer? Mr. SEEGER: I will tell you what my answer is. I feel that in my whole life I have never done anything of any conspiratorial nature and I resent very much and very deeply the implication of being called before this Committee that in some way because my opinions may be different from yours, or yours, Mr. Willis, or yours, Mr. Scherer, that I am any less of an American than anybody else. I love my country very deeply, sir. Mr. SCHERER: I think that there must be a direction to answer. Chairman WALTER: I direct you to answer that question. Mr. SEEGER: I have already given you my answer, sir. Mr. SCHERER: Let me understand. You are not relying on the Fifth Amendment, are you? Mr. SEEGER: No, sir, although I do not want to in any way discredit or depreciate or depredate the witnesses that have used the Fifth Amendment, and I simply feel it is improper for this committee to ask such questions. Mr. SCHERER: And then in answering the rest of the questions, or in refusing to answer the rest of the questions, I understand that you are not relying on the Fifth Amendment as a basis for your refusal to answer? Mr. SEEGER: No, I am not, sir. . . .
Mr. TAVENNER: You said that you would tell us about the songs. Did you participate in a program at Wingdale Lodge in the State of New York, which is a summer camp for adults and children, on the weekend of July Fourth of this year? Mr. SEEGER: Again, I say I will be glad to tell what songs I have ever sung, because singing is my business. Mr. TAVENNER: I am going to ask you. Mr. SEEGER: But I decline to say who has ever listened to them, who has written them, or other people who have sung them. Chairman WALTER: I said, Did you sing it on that occasion? Mr. SEEGER: I have sung that song. I am not going to go into where I have sung it. I have sung it many places. Chairman WALTER: Did you sing it on this particular occasion? That is what you are being asked. Mr. SEEGER: Again my answer is the same. Chairman WALTER: You said that you would tell us about it. Chairman WALTER: I direct you to answer the question. Did you sing this particular song on the Fourth of July at Wingdale Lodge in New York? Mr. SEEGER: I have already given you my answer to that question, and all questions such as that. I feel that is improper: to ask about my associations and opinions. I have said that I would be voluntarily glad to tell you any song, or what I have done in my life. Chairman WALTER: I think it is my duty to inform you that we don’t accept this answer and the others, and I give you an opportunity now to answer these questions, particularly the last one. Mr. SEEGER: Sir, my answer is always the same. Chairman WALTER: All right, go ahead, Mr. Tavenner. Mr. TAVENNER: Were you chosen by Mr. Elliott Sullivan to take part in the program on the weekend of July Fourth at Wingdale Lodge? Mr. SEEGER: The answer is the same, sir. Mr. WILLIS: Was that the occasion of the satire on the Constitution and the Bill of Rights? The first performance of a new song, “If I Had a Hammer,” on the theme of the Foley Square trial of the Communist leaders, will be given at a testimonial dinner for the 12 on Friday night at St. Nicholas Arena. . . . Among those on hand for the singing will be . . . Pete Seeger, and Lee Hays . . . and others whose names are mentioned. Did you take part in that performance? Mr. SEEGER: I shall be glad to answer about the song, sir, and I am not interested in carrying on the line of questioning about where I have sung any songs. Mr. TAVENNER: I ask a direction. Chairman WALTER: You may not be interested, but we are, however. I direct you to answer. You can answer that question. Mr. SEEGER: I feel these questions are improper, sir, and I feel they are immoral to ask any American this kind of question. Mr. TAVENNER: Have you finished your answer? Mr. SEEGER: Yes, sir. . . .
Mr. TAVENNER: Did you hear Mr. George Hall’s testimony yesterday in which he stated that, as an actor, the special contribution that he was expected to make to the Communist Party was to use his talents by entertaining at Communist Party functions? Did you hear that testimony? Mr. SEEGER: I didn’t hear it, no. Mr. TAVENNER: It is a fact that he so testified. I want to know whether or not you were engaged in a similar type of service to the Communist Party in entertaining at these features. Mr. SEEGER: I have sung for Americans of every political persuasion, and I am proud that I never refuse to sing to an audience, no matter what religion or color of their skin, or situation in life. I have sung in hobo jungles, and I have sung for the Rockefellers, and I am proud that I have never refused to sing for anybody. That is the only answer I can give along that line. Chairman WALTER: Mr. Tavenner, are you getting around to that letter? There was a letter introduced yesterday that I think was of greater importance than any bit of evidence adduced at these hearings, concerning the attempt made to influence people in this professional performers' guild and union to assist a purely Communist cause which had no relation whatsoever to the arts and the theater. Is that what you are leading up to? Mr. TAVENNER: Yes, it is. That was the letter of Peter Lawrence, which I questioned him about yesterday. That related to the trial of the Smith Act defendants here at Foley Square. I am trying to inquire now whether this witness was party to the same type of propaganda effort by the Communist Party. Mr. SCHERER: There has been no answer to your last question. Mr. TAVENNER: That is right; may I have a direction? Mr. SEEGER: Would you repeat the question? I don’t even know what the last question was, and I thought I have answered all of them up to now. Mr. TAVENNER: What you stated was not in response to the question. Chairman WALTER: Proceed with the questioning, Mr. Tavenner. Mr. TAVENNER: I believe, Mr. Chairman, with your permission, I will have the question read to him. I think it should be put in exactly the same form. Mr. SEEGER: “These features”: what do you mean? Except for the answer I have already given you, I have no answer. The answer I gave you you have, don’t you? That is, that I am proud that I have sung for Americans of every political persuasion, and I have never refused to sing for anybody because I disagreed with their political opinion, and I am proud of the fact that my songs seem to cut across and find perhaps a unifying thing, basic humanity, and that is why I would love to be able to tell you about these songs, because I feel that you would agree with me more, sir. I know many beautiful songs from your home county, Carbon, and Monroe, and I hitchhiked through there and stayed in the homes of miners. Mr. TAVENNER: My question was whether or not you sang at these functions of the Communist Party. You have answered it inferentially, and if I understand your answer, you are saying you did. Mr. SEEGER: Except for that answer, I decline to answer further. . . .
Mr. SCHERER: Do you understand it is the feeling of the Committee that you are in contempt as a result of the position you take? Mr. SEEGER: I can’t say. Mr. SCHERER: I am telling you that that is the position of the Committee. . . .
January 29, 2014 - A number of excellent reflections on Seeger and his political and humanitarian convictions have come out, including this from Mondoweiss and this from FAIR.